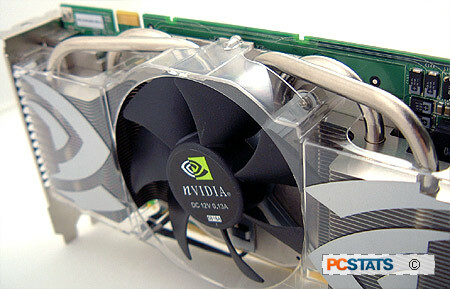 There are no architectural differences between GeForce 7800GTX 256MB and GeForce 7800GTX 512MB videocards. Both class of graphics card use identical Geforce 7800GTX GPUs, though the memory and GPU speeds have been modified. What nVIDIA has done to differentiate the two cards is tweak the speed of the 512MB version GeForce 7800GTX core to 550 MHz. The 3D operating frequency of the 215MB version Geforce 7800GTX is 430MHz, so there is a difference of 120MHz between the two. That variance will be most visible when high resolution gaming, with AA and AF enabled. To keep up with the speed changes to the GPU, the memory frequency has been increased from 1.2 GHz for the 256MB version GeForce 7800GTX, to a blistering 1.7 GHz on the 512MB version GeForce 7800GTX videocard. Nice. In situations where Anti-Aliasing and Anisotropic Filtering are enabled, the faster memory really can make a huge difference, and PCSTATS will explore this aspect a bit later with our advanced benchmarks. While nVIDIA drivers have the capability of displaying the GPU core temperature, the program thus far does not have the ability log this information. Overclockers and enthusiasts are better served with RivaTuner which is able to log 3D clock, memory speeds and core temperatures. This data can come in handy for overclockers who are looking at different means of squeezing out extra performance. To log temperatures you'll first need to download a copy of RivaTuner (email colin for the link). With the program loaded up, go to the 'Target Adapter' box and look for the triangle pointing towards the bottom right hand corner. Click the triangle to open up a few options then select the film/magnify glass option and that will load up the software monitoring box. Next, dial in your overclocking setting and run a 3D test. Sit back and watch how the core temperature reacts to that game, and take it from there. Okay, so we have faster core and memory speeds, and twice the amount of on-videocard memory, but is this all really necessary to play the latest video games? To be realistic, a videocard with 512MB of memory is a total luxury. It's not a necessary feature to run the latest games by any stretch, but it does help considerably when all the eye candy is cranked to the max. Got it? Good.